Quartz. White resin strap. White dial. Mineral glass. Date/day/month. Auto-LED light. Shock-resistant. Magnetic resistant. World time function. Stopwatch. Timer. Alarm. Snooze. Speed display. 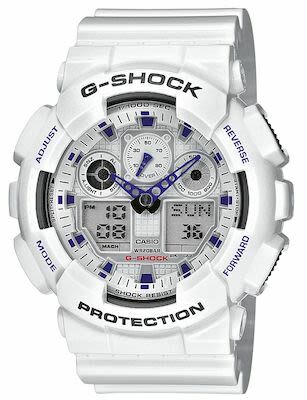 Water resistant 200 m. 51.2 mm case.